Clothes labels. 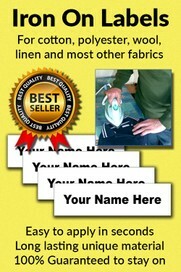 Quality IRON ON or Woven Labels, Shoe Labels, Washing & CARE LABELS for a small business eg "Designed by." See website for more items. All of New Zealand. Courier service available for next day delivery. 24 hour ordering through our website. Next day delivery on some products - contact us for Courier informatio­n. NAME IT Labels is a family business, owned and managed by Tim & Sherry Ede. All of our products are printed here in New Zealand which is why we can offer great delivery times. We have supported New Zealand schools and kindergartens with fundraising programmes for 17 years. We supply to the top boarding schools in New Zealand. We are continually upgrading and offering the best possible materials for our label products. We reply personally to every order placed with us on our website. Thank you Sherry and the team at Name It for helping me get all my mothers clothes and items labeled. I also got some labels for my daughter who just started school. The labels are fantastic and are high quality unlike others that I have tried before. They really do stay on. Will be ordering again. Recommended A++. I am most impressed by the speed, communication and quality provided, 4 days from ordering to being in my letterbox, emailed every step of the way. A big plus being they are wholly New Zealand company.